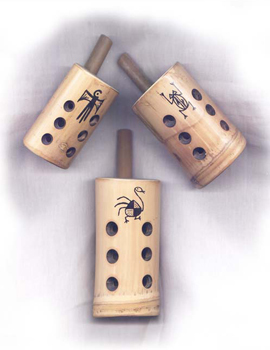 Andean wind instrument, originally made of ceramics. This one is constructed entirely of tacuara cane and its mouth of outbreak of bamboo, its size oscillates between 6 to 8 cm of stop. Although the instrument was originally made of clay or ceramics as they were built on the Bolivian or Peruvian highlands, these ocarinas have a similar sound. At the front there are 6 holes which cover 3 and 3 with each hand, leaving at the back 2 holes to be covered by the thumbs of both hands. To achieve a musical scale, the fingers should be progressively uncovered from the bottom upwards starting first by the three holes of the right hand, then the remaining 3 of the left and finally the back holes. The sound is achieved by gently blowing the small piece of bamboo. His record is one octave and one note. Do - Re - Mi - Fa - Sol - La - Si - Do - Re. 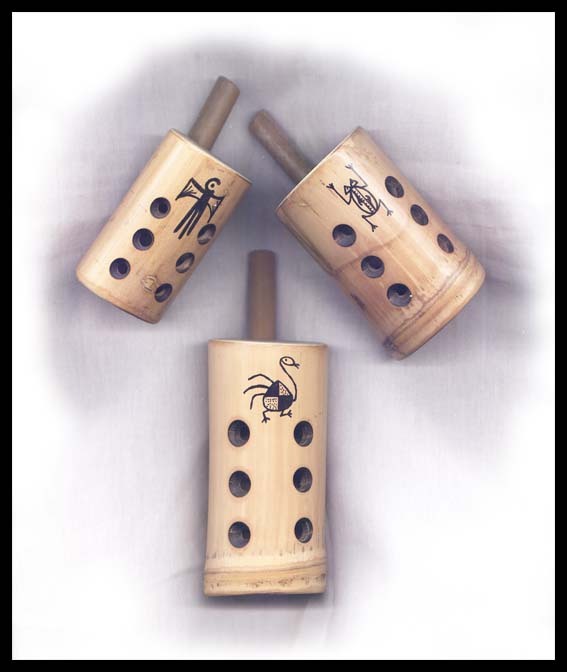 It is a very simple musical instrument to play and to quickly build typical melodies. , you can write us by the CONTACT section to buy it, Thank you.